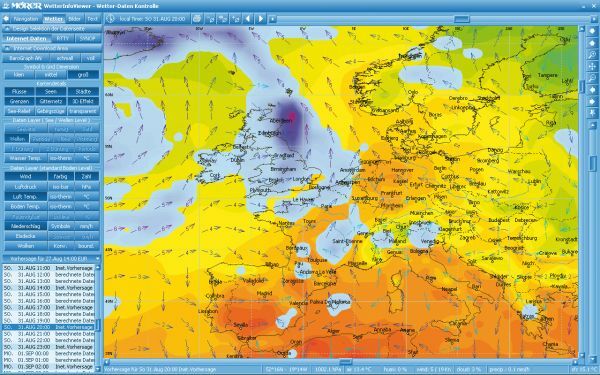 Many Weatherinfobox users, we have been asking for an access way from your smartphone or tablet PC. Due to the restricted USB connectivity of most mobile devices, only a wireless solution came into consideration. Whether iPhone, iPad or Android, WIB WIFI HUB permits access to all data received from the Weatherinfobox messages from your smartphone or tablet PC. For this, the Weatherinfobox is connected via USB to the WIB WIFI HUB. The WIB WIFI HUB prepares the data of the connected Weatherinfobox. The data are available for the smartphone on a "web server" is available. The smartphone has access to the Web browser installed via WLAN to the data. long wave frequency 147.3 kHz. Making the short wave frequencies. The mounting frame is made of the same material as the Weatherinfobox. The carrier plate is 5 mm thick. The Weatherinfobox is used there without changes to the device. For the Weatherinfobox WIB3S, WIB4S and WIB-Europe (WIBE). The antenna can be using the mounting kits (No. 7504-7506), mounted on different antenna feet. for weather info boxes WIB2BX and WIB3S. Very good reception performance even under difficult conditions. The sensitivity to interference is compared with an electrically operating antenna considerably lower, since ferrite antennas have a directional effect. The further away the transmitter is more important it becomes to align the antenna to the transmitter. Incl. 5 m antenna cable with BNC connector. for weather info boxes WIB2BX, WIB3S, WIB4S and WIB-Europe (WIBE). Adaptation of the isolated backstay as a receiving antenna. The isolated backstay as a very powerful passive antenna provides a very good reception performance with low noise sensitivity. We recommend mounting the balun below deck. The connection to the backstay is then established via a braided cable and a backstay. for WIB1, WIB2 and WIB3. for WIB1, WIB2, WIB2D, WIB3 and WIBD. Receiving end DWD Texel bonds may be converted into graphical images series, and drawn barograph charts and also (optional) Internet data is loaded from MeteoServer.net. 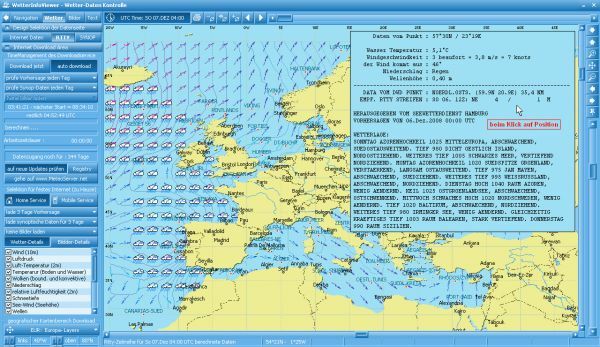 In addition, on a high resolution chart display surface, be a route via GPS controlled and represents than Meteo route. The route is calculated with the weather and the travel time and colored according to the weather conditions. The charts contained herein are not intended for navigation. Receiving end DWD Texel bonds may be converted into graphical images series, and drawn barograph charts and (optional) Internet data is loaded from MeteoServer.net. 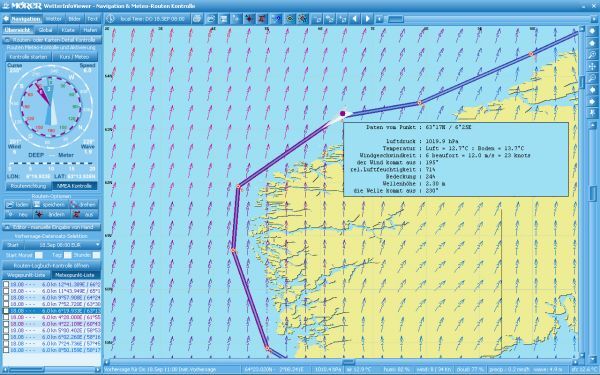 We assume no liability for the timeliness and accuracy of nautical charts. • Practical support with two foam rubber-coated jaws, give the device even in rough seas secure fit. The device will be released on a button. • the holder is rotatably supported on the mounting base, thus the required result of the ferrite antenna orientation is possible, in spite of the holder.